Without sulphates and hypoallergenic, the Coslys Organic Hypoallergenic Conditioner is a real detangling care soft and respectful of the scalp. Featuring nourishing properties, it naturally sheaths the hair fiber and easy the combing of hair. It also protects your hair from external aggressions and prevents them from drying out. Its sweet fruity fragrance delicately envelops your hair. Your hair is soft, nourished and fortified! Thanks to its extreme softness, theCoslys Organic Hypoallergenic Conditioner is perfectly adapted to sensitive and fragile scalps! The Coslys Organic Hypoallergenic Conditioner detangle hair! On clean hair and wrung out, apply a nutty of conditioner on the lengths by avoiding to put on the roots not to weigh them down and make them grease more quickly. Leave on for about 2 to 3 minutes then rinse thoroughly. In case of contact with eyes, rinse with plenty of water. If your hair needs to benefit even more from its nourishing and protective benefits, you can use it in a mask once or twice a week. 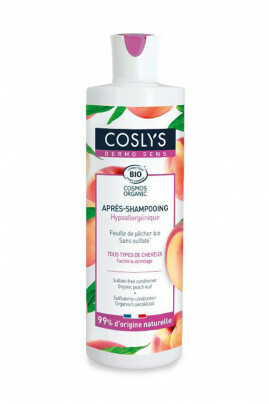 Complete your organic care routine for sensitive scalps with Coslys Hypoallergenic Shampoo! Organic and natural ingredients for soft and soft hair! Aqua (water), oleic / linoleic / linolenic polyglycerides, cetearyl alcohol, spiraea ulmaria flower water *, distearoylethyl dimonium chloride, phospholipids, helianthus annuus (sunflower) seed oil, corylus avellana (hazel) seed oil *, prunus persica (peach) leaf extract *, sclerotium gum, glycerin, cetearyl glucoside, perfume (fragrance), aloe barbadensis leaf juice powder *, levulinic acid, polyglyceryl-6 stearate, polyglyceryl-6 behenate, sodium benzoate, sodium levulinate.